In the fall of 2016, an 18-year-old tried for a second time to take his own life. After his second discharge from hospital in less than a month, a university administrator handed him a notice of eviction from residence. Hallways at the University of Alberta are decorated with posters with reassuring slogans such as "Love yourself" and "Take a break and find balance." One U of A student in Edmonton says that when he walks by the slogans, he feels as if it's all for show. In the fall of 2016, the 18-year-old tried for the second time to take his own life. After his second discharge from hospital in less than a month, a university administrator came to meet him. But instead of offering help, the staff member handed him a notice of eviction from his residence. "I couldn't believe it," said the student, who told his story to Radio-Canada. CBC News is calling him Eric to protect his identity. "I was being evicted for trying to attempt suicide. I hadn't put anyone else in danger." Eric was told he had to move out of his campus residence because he had violated his residency agreement. The agreement states that "the resident will not endanger persons or damage property in the premises and residence." The administrator handed the student a trespass notice and an eviction letter that said: "You admitted to attempting to commit self-harm within your residence and this was the second attempt." The letter also said: "The type of example your actions support have no place in an academic learning environment." Eric said he had experienced symptoms of depression since his early teen years, but at university his symptoms worsened. "Things suddenly felt meaningless," he said. He first attempted suicide in his second year of university. Police intervened and took him to hospital. After he was discharged, the U of A gave him a list of phone numbers to call if he needed help. "I never gave it [another] thought to contact those people," he said. He said the help he was offered was based on an assumption that his actions were a cry for help, not a serious suicide attempt. One week later, he still had constant thoughts of dying, he said. He tried again to take his own life. Again, police took him to hospital. When he returned to his dorm, staff had booked him a hotel room for the night and told him they would meet with him the next morning, he said. That's when the university took action. Officials at the U of A haven't explained how the decision could have been approved. In an interview this month, André Costopoulos, dean of students, said there is no policy that includes "considering self-harm or actively self-harming" as a reason to ban a student from a campus residence. Costopoulos wouldn't comment on the specifics of Eric's case, but said it's possible the decision was based on erroneous information. Two weeks after Eric's eviction, the same administrator who gave him the letter emailed him about reconsidering the previous decision. But Eric said the damage was done. "I just felt like I needed a safe place to stay where I could try to work this out in my head, where I can feel comfortable," he said. "They took that away from me." 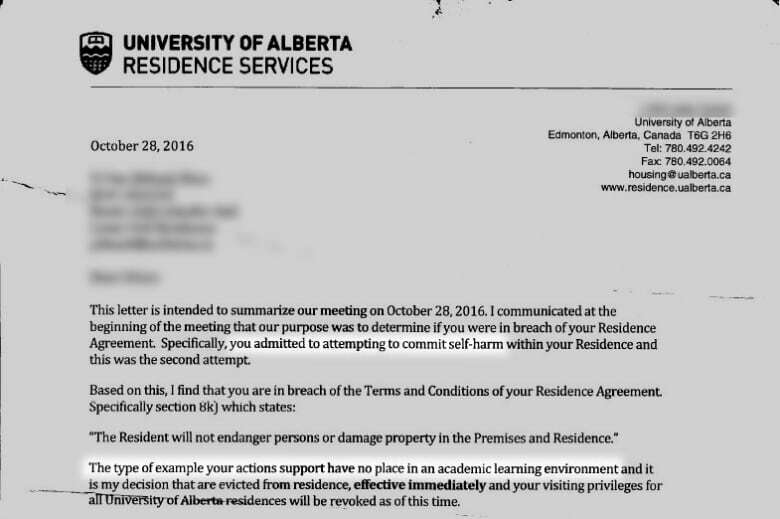 The University of Alberta Students' Union said the eviction is unacceptable. A letter like the one Eric received is "never justifiable, never acceptable," Andre Bourgeois, vice-president of student life, said in an interview this month. Bourgeois said the students' union is aware of more than one case when a student was evicted under similar circumstances. He said that he's concerned that a recent directive from Alberta Advanced Education to have the province provide clinical care services for students will make it harder for school staff to make decisions in the best interests of students with mental health issues. "I wouldn't say that I'm confident that the university will never make another mistake when it comes to suicide or mental health," Bourgeois said. Eric has thoughts about that, too. 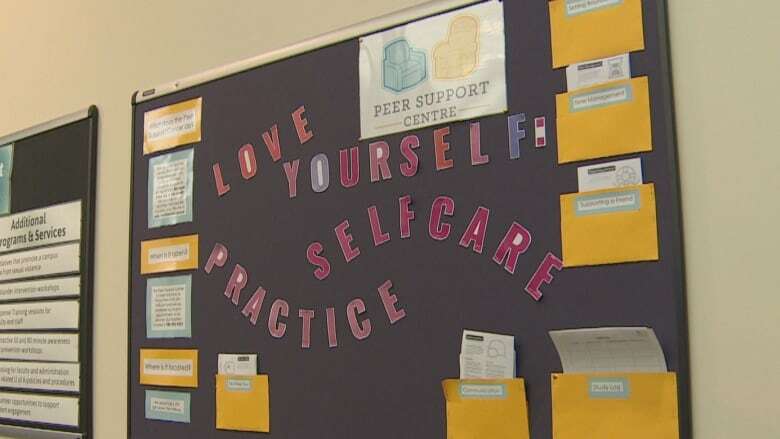 Mara Grunau, executive director of the Calgary-based Centre for Suicide Prevention, said suicidal thoughts are almost always the result of multiple factors, but students can be particularly vulnerable to certain stresses. "What we typically see with students is the pressure they feel to achieve," Grunau said. "It can also be pressure from living away from home for the first time." Symptoms of mental illness also often reveal themselves in late adolescence, she said. Since 2017, five University of Alberta students have died from suicide, according to Costopoulos. Still a student, Eric has sought psychiatric help and continues to fight his depression. If you are dealing with thoughts of suicide you can call the 24-hour Canada-wide crisis service hotline: 1-833-456-4566.